The four shorts we selected to feature this month cover a 10 year period from 1935 to 1945. They include dogs, dancing, danger and a few dead bodies. Hoi Polloi released August 29, 1935. Cast & Crew: Directed by Del Lord. Story & Screenplay by Felix Adler. All the cast, except for Larry, Moe & Curly, were uncredited, including Bud Jamison, Phyllis Mitchell, Kathryn McHugh, James C. Morton and Blanche Payson. Short Take: This is The Boys first foray into the world of high society, a place that is always hilarious when The Boys show up. In this Pygmalion inspired plot, two professors argue over which influence molds gentlemen. One claims environment is the keystone to social distinction, the other asserts that heredity is the backbone of social life. They pick on nearby trash men (The Stooges) to prove their theory. After spending months in training, Larry, Moe and Curly attend an elegant dinner party, ultimately disproving both professors’ theories. A routine that is included in two other shorts is when Curly gets into an argument with another woman (usually while dancing) and he and the woman slap each other in the face repeatedly. This usually ends with them suddenly smiling at each other and continuing to dance like nothing happened. Also used in False Alarms and An Ache in Every Stake. The couch spring gag always renders hilarity. The third Stooge unknowingly gets a spring from a couch caught on his behind. The end of the spring gets caught on something else, causing the third Stooge to get repeatedly pulled back into it as he tries to move forward. It was used in four other shorts. Can you name them? Phyllis Crane must have had an awful headache after this short was completed. In the dancing scene, Moe, dancing with Phyllis, slips and falls on Larry’s loose shoe – not planned I’m sure, and poor Phyllis falls with Moe. Her forehead and face hit the floor with the full force of both hers and Moe’s weight. An audible gasp is heard from a cast member just before the scene is abruptly cut. Ouch! 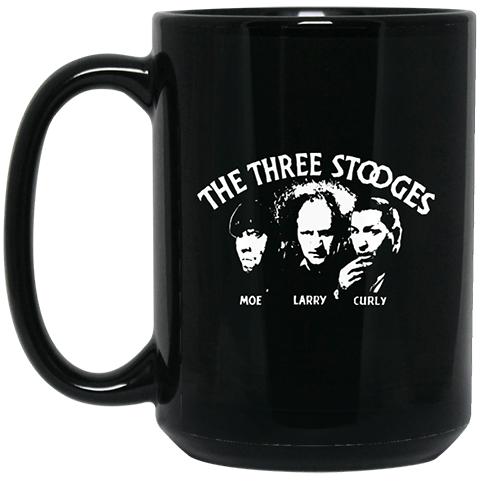 As we have noted before, there are many references to the works of William Shakespeare in The Three Stooges body of work. For Hoi Polloi, we have the play Pygmalion by George Bernard Shaw as the underpinning of this short. Among the many memorable scenes in Hoi Polloi, the dance lesson is one of the most famous from all of the shorts with Geneva Mitchell giving a terrific performance as the dance instructor. Calling All Curs, released August 25, 1939. Cast & Crew: This is another short with only Larry, Moe & Curly credited. The uncredited cast included Lynton Brent, Cy Schindell, Ethelreda Leopold and Beatrice Blinn. Another cast member as a nurse is Beatrice Curtis, remembered mostly as Charity from the short Back To The Woods. Jules White directed the short and also received an Associate Producer credit. The screenplay was by Elwood Ullman & Searle Kramer with the story by Then Gooden. Short Take: The Stooges are veterinarians treating a rich lady’s dog Garcon. Two men, posing as reporters, come to check out the Stooges’ clinic. They are really dognappers who capture Garcon and hold him for a $2000 ransom. 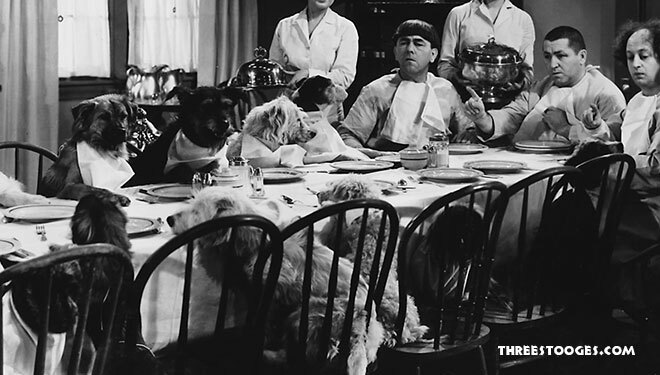 The Stooges then search for Garcon and arrive at the home of the dognappers for a showdown. This short has several facets that are pure Three Stooges: They get to act as doctors – well, veterinarians – work with animals, flirt with nurses, chase crooks, use medical tools – that they give crazy names and create mayhem at a hospital and at the home of the well to do. The pace of the visual and verbal gags in this short is incredible: Larry, Moe & Curly average a different bit every six seconds! This was by design by director Jules White: To string together gaga end to end, one after the other throughout the short. Curly was a dog lover and had many canine co-stars. Cury must have been in dog heaven during this scene. Cast & Crew: Vernon Dent, Dudley Dickerson, Lynton Brent, John Tyrell, Dorothy Appleby, Marjorie Kane, Joe Palma, Al Thompson, Blanche Payson, Johnny Kascier and Ned Glass were among the cast that also included Al Seymour, Poppie Wilde, Charles Phillips, Bert Young and Charles Doherty. Directed by Jules White from a screenplay by Clyde Bruckman and a story by Charles L. Kimball. Short Take: The Stooges’ friend Jerry informs them of a great money-making scam: buy insurance, go to the insurance doctor and claim insanity, and be paid $500 a month for the rest of their lives. Eager for easy money, they take a policy out on Curly and then proceed to bring him into the insurance doctor, Dr. D. Lerious’s office with Curly masquerading as a dog. Curly’s performance is so convincing that the alarmed doctor demands that Curly be prepared for “cerebrum decapitation.” And, the chase begins. One of the largest casts to appear in any short. Again, the only credited cast was Larry, Moe & Curly while the uncredited cast included many of the staples among the supporting players. A storyline in itself: Kimball has almost 100 credits as an Editor and From Nurse To Worse was his only Story credit for a Stooge short. 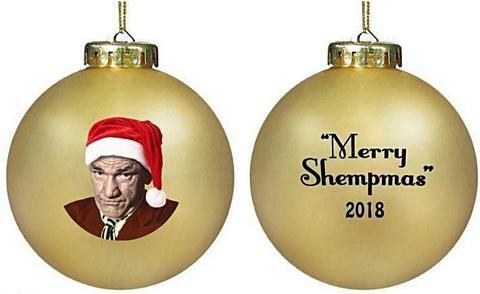 In fact, it was his only story credit in a 50+ year career. A man with many talents: As noted, Jules White produced and directed this short. The song heard in the short – ‘I’m A Cowboy From The Western Plains’– was an original music composition by Jules White. The traffic footage in the short came from Dizzy Doctors, making this short the first to use footage from a previous short. Vernon Dent played many characters in the shorts many with some funny names. In this one, his name is Dr. D. Lerious. Cast & Crew: Larry, Moe & Curly and Ted Lorch and Fred Kelsey also credited. Leo Palma, Victor Travers, Al Thompson and John Tyrell performed in uncredited roles as did Judy Malcolm and Dorothy Vernon. Jules White produced and directed with the screen play by his brother Jack White forum a story by Gil Pratt. Short Take: The Boys have been involved in mysteries in several prior shorts but this is their first murder mystery as the centerpiece of the short. categorized as a ‘thunderstorm mystery’, a type of film popular since the 1930’s that has story weather, secret passageways, hidden bodies and usually a guilty butler. Moe reads in the newspaper that Curly is the missing heir to his rich uncle Bob O. Link’s estate. The Stooges go to the mansion, only to find out that Prof. Bob O. Link didn’t die, he was murdered! And both his body and the will are missing. The Boys have to spend the night in the spooky old house and solve the mystery. Danger lurks behind every corner. Eventually, the butler and the maid are unmasked as the killers, the body of Curly’s rich uncle and the will are found so Curly finally inherit a whopping Sixty-seven cents! What’s In A Name: Jack White worked on many Three Stooges shorts often credited as Preston Black. More Name Games: In this short Moe is Moe and Larry is Larry, just like in most shorts. Curly is Curly but he has the full name of Curly Q. Link as his name is integral to the plot. This short is often marred for being the beginning of the “ill Curly” era, with his deep voice and delayed reactions. 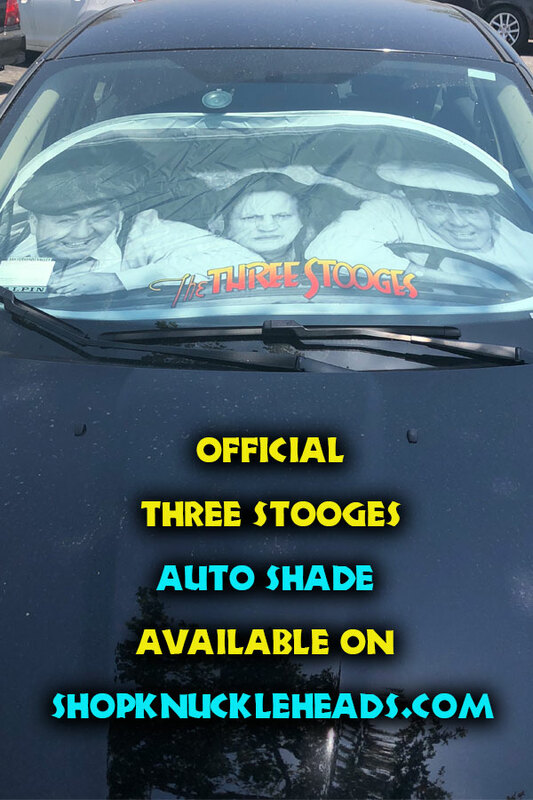 His health would decline even further in the following short when his skin became pale and by 1945’s The Yoke’s on Me, it is sadly apparent that he is ill.
Now Available In Stores & Online The Three Stooges New Comic Books!